Meet with an estate planner to prepare directives on how to care for your home and other real estate properties after your death. You may be familiar with putting things such as a will, health care decisions, and charitable giving wishes in place for your aging parents or yourself. It’s wise to also consider what’s to become of a home in the event of a homeowner’s death. Time to create or revisit your estate plan. The article 12 Critical Questions to Ask Your Aging Parent made me think about the importance of scheduling an appointment with an estate planner. 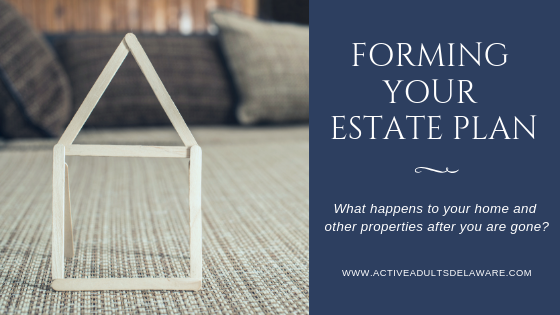 In our commitment to discuss relevant topics and resources for Boomers living the active adult lifestyle, let’s take an overview look at estate planning when you own a home or other real estate properties. When a homeowner dies the estate will go through probate—a court supervised procedure for paying any outstanding debts and distributing the assets of the deceased. The home may be sold to pay debts or pass to an heir or beneficiary based on your will. The purpose of a will is to state someone’s intentions after death. A trust is a contract between the grantor and beneficiaries. A trust distributes property outside the probate process. When aging parents have a living trust this excludes the family home from the probate process. If the property still carries a mortgage those named in the trust would need to contact the lender to discuss assuming the loan and may need to complete a loan application with the lender. Most commonly, a homeowner anticipates outliving their mortgage. Should the homeowner die before the home loan has been repaid there are several options which can take place with the lender. Relatives or heirs can assume the current loan or refinance the terms. If there’s a co-borrower, such as a spouse, still living than most likely the mortgage payments are in this person’s name as well so things would continue as they have been. If the borrower can’t repay because of lack of funds or death, the lender can foreclose but this is often a last resort. Lenders would rather have the loan paid off than foreclose on a property. A Revocable Living Trust. This trust is used to avoid probate and provide for management of your property. This can be useful in both life and after death. Property Power of Attorney. This allows an agent you name to manage your property. Provide asset protection for partnership property from the creditors of a partner. Provide protection for limited partners from creditors. Enable gifts to children and parents maintaining management control. Charitable Remainder Interest Trust. This type of trust is an irrevocable trust where a donor transfer property to a charitable trust and retains an income stream from the property transferred. The donor receives a charitable contribution income tax deduction and avoids the capital gains tax on the transferred property. Documenting your wishes brings peace of mind to a homeowner and their loved ones. It means during one of the most stressful times in one’s life the concern of maintaining the family home is secured and planned. If your estate planning includes making arrangements for you to sell your home, we’re here to help. We’ll work with you to make the best plans for when the time arrives. Contact our office today to get the conversation started.